Amazon Prime is one of those incredibly useful features of Amazon that makes it so easy to keep buying stuff from their site. I realized after using Amazon for years to buy stuff that I would recoup the $99 cost in no time. Of all the stuff that I buy, 80% is ordered online and 80% of that is from Amazon. The ability to get an item in two days for free or the next day for only a few bucks has come in handy so many times it’s crazy. However, up until now, I thought the only way for anyone else in my family to enjoy the benefits was to order it for them through my account and then just have it shipped to them. Not a bad way to do it, but I still had to either pay for it myself or get their credit card information, which is kind of a pain. 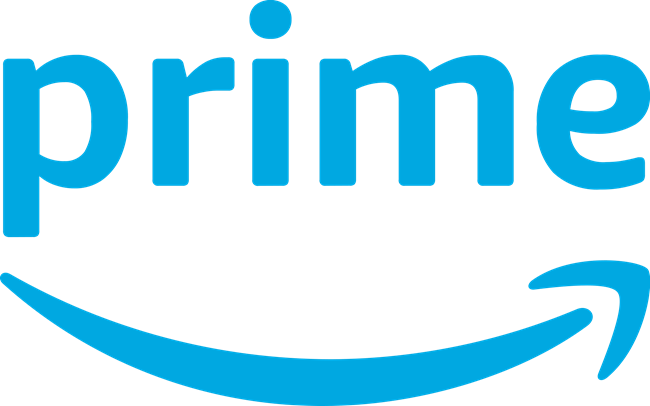 Luckily, there is a way to share your Amazon Prime shipping benefits with others for free. 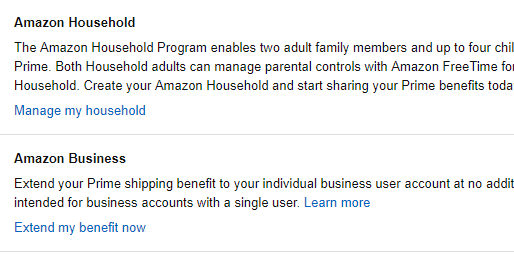 According to Amazon, you can share the benefits with up to one other adult and four children. Note that the adult you share your account with will be able to view your payment information. Previously, Amazon was OK if you shared your account with friends, but now they really only want you to share with your own trusted family. To do this, log into your Amazon account and click on Your Account under Accounts & Lists. Next, click on the big Prime button to view benefits and payment settings. At the top, you’ll see some summary information about your Prime membership like how long you have been a member and how many payments you have made. You’ll also see your default 1-click settings, etc. At the bottom is where you can invite someone else to share your shipping benefits. Click on Share your Prime benefits to expand it. Next, click on the Manage my household link to add up to at least one more adult and up to four children. 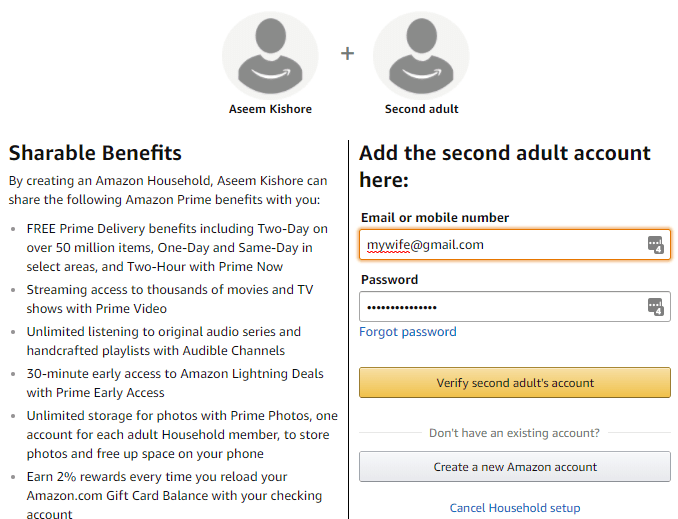 To add a second adult, you have to enter their Amazon email and password. If they do not have an Amazon account, they will have to create one. Once you add the adult, you can go ahead and add the children too. You’ll have to add in everyone’s gender and birthdays and then you can control what they have access to. 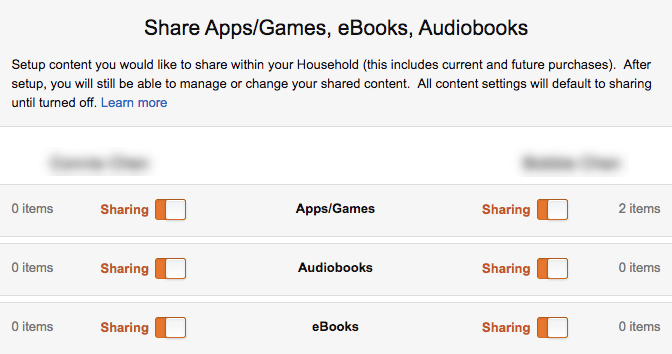 You can choose whether to share apps/games, audiobooks, ebooks, etc. You can also click on Manage Your Content and Devices to control access to Prime Video, books, apps, music, etc. That’s about it! Something that apparently has been around for a long time, but I never knew about! Hopefully, if you use Amazon Prime and didn’t know about this, you can make some family members happier by saving them money on shipping costs and digital purchases. Enjoy!